This was the scene outside of Gyro City as I was picking up some lunch. 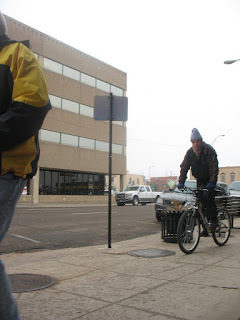 It was nice to see, even with the cold temperatures, that people rode their bicycle or walked during their lunch breaks. There are a lot of great lunch spots in downtown and the Union district, so get some fresh air, take a walk and get something good to eat. A few of my favorite spots, in no particular order.